New York’s sibling-driven unit mines ancient seam to harvest emotional storm. Even though this ensemble’s name means “nailer” and suggests a heavy clang, there’s something exquisite about it, and such a contradiction – reflected also in their first album’s title – is what “Thunder ‘N’ Lightning” is about. 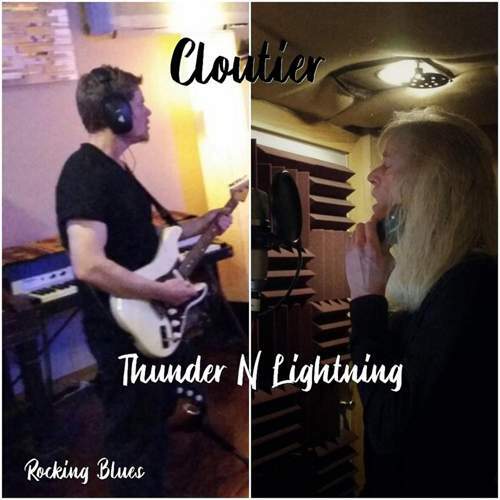 Or, actually, what most blues records must be about – only Mark Cloutier’s guitar nails those blues with much gusto, especially in the company of his singing brother Myke. Which is why all the tracks on display are often so easygoing, if heavy – gravitating toward rockabilly but always looking past retro veneer to reach for roots, and come home to roost. The band’s approach is laid on the line with opener “Flipping And Flapping” – a slider-oiled stroll through playful rumble whose simple beat sharpens the piece’s point – and the title number, while the same rough, though less hectic, romp via “Whispering Howling Wind” helps build dramatic tension, especially when filigree licks seep into the song. The drift may get a little bit histrionic, in punk fashion, as the heftier “Hard Luck Man” and “Every Little Thing” suggest, but again, Mark’s complex six-string textures create a fantastic counterbalance to Myke’s deliberately desperate yelps. The brothers envelop “I Call Home” in a strings-elevated tenderness and infuse “Dreaming A Dream” with delicate tremble, yet they also ably entrance the listener with the jagged jive of “Down” and embrace eternity on “Man On The Mountain” that’s seriously groovy and grandiose at the same time. Still, it’s “Green Eyed Foolish Man” where they heart is – in the realm of electric blues – and, staying there, the Cloutiers can, paradoxically, go far.